Smaller in size (but not in flavor), it fits in a mini fridge! 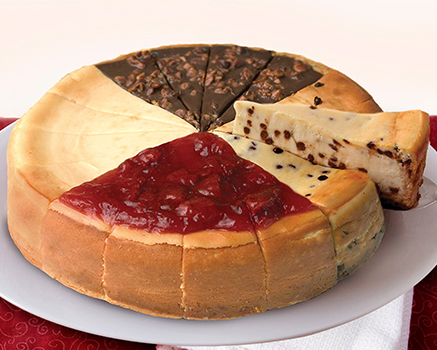 One 8" Original Plain Cheesecake and six Original Dippers®, frozen cheesecake dipped in chocolate, served on a stick. Cream Cheese (Pasteurized Milk and Cream, Cheese Culture, Salt, Carob Bean Gum, Guar Gum), Sugar, Sour Cream (Cultured Nonfat Milk and Cream, Corn Starch, Whey, Guar Gum, Carrageenan, Carob Bean Gum, Enzymes), Wheat Flour, Egg, Butter (Cream, Salt), Powder Sugar (Sugar, Corn Starch), Modified Corn Starch, Vanilla Extract, Egg Whites, Salt, Soy Lecithin.